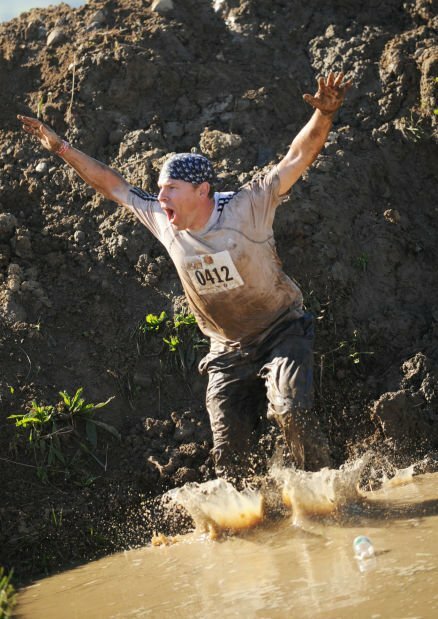 Brian Niland leaps into a pit of mud Saturday morning at the Finger Lakes Mud Run in Owasco. Victoria Fiduccia, 11, leaps over a pit as Hailey Shepherd, 12, climbs out of the mud. Participants of the Finger Lakes Mud Run scale a wall. Steve Boone splashes into a pit of mud. A Participant splashes into a pit of mud Saturday morning at the Finger Lakes Mud Run in Owasco. Brian Niland splashes into a pit of mud Saturday morning at the Finger Lakes Mud Run in Owasco. Laura Robson leaps into a pit of mud Saturday morning at the Finger Lakes Mud Run in Owasco. Jeff Spencer slides down a hill during Finger Lakes Mud Run Saturday morning in Owasco. Teachers from Cato-Meridan dressed as super heros Saturday morning to participate in the Finger Lakes Mud Run in Owasco. Nia Boothman, 11, slides into a pit of mud Saturday morning at the Finger Lakes Mud Run in Owasco. Participants of the Finger Lakes Mud Run scale a wall Saturday morning in Owasco. 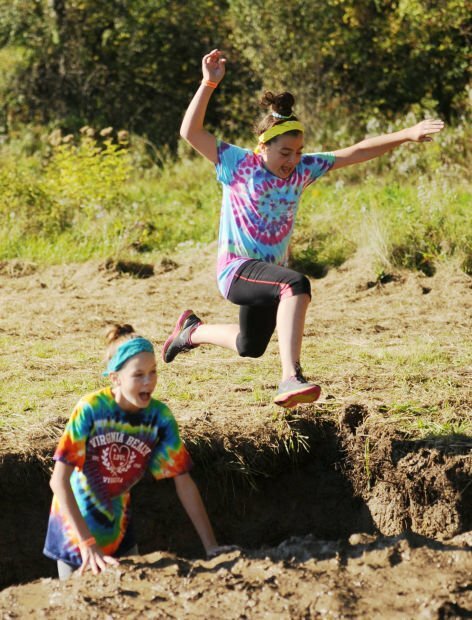 Victoria Fiduccia, 11, leaps into a pit of mud Saturday morning at the Finger Lakes Mud Run in Owasco. Participants leap into a pit of mud Saturday morning at the Finger Lakes Mud Run in Owasco. A Participant leaps into a pit of mud Saturday morning at the Finger Lakes Mud Run in Owasco. OWASCO | For participants in the 2014 Finger Lakes Mud Run, the event's course provided an uphill battle and a downhill slide toward a pit of moist mud. And finishers, covered from head-to-toe in slimy muck, reveled. Now in its third year, Saturday's fundraiser combined physical fitness with an old-fashioned outdoor bash in support of the Brian Bisgrove Home of Courage. Located atop a hill amid a patchwork of mown fields is Everest Park, the former 160-acre farm where Bisgrove grew up, which hosts the run. The event's net proceeds will fund the operation and maintenance of the Home's chief facility, a large log cabin providing respite for families with ill loved ones. In 1998, Bisgrove died of cancer at the age of 21. Never able to fulfill his dream of becoming a priest and sponsoring boy's clubs, Champions for Life took up Bisgrove's spiritual cause and operates the facility and its bucolic, peaceful setting. But Saturday was hardly quiet. Not a race, exactly, the un-timed run saw more than 700 adults and children break a sweat and get filthy as they ran through their choice of three muddy obstacle courses. A long, short and a "Mini Muddy" military-style course boasted 36 obstacles in total. With names such as "Lost Sneaker," "Frothy Woodchuck" and "Swamp Trench," the obstacles challenged as often as they inspired camaraderie and encouragement. Rock 'n' Roll standards from the likes of the Rolling Stones and Bruce Springsteen raged from speakers near the starting line pumping up participant's adrenaline as waves of runners departed every 15 minutes from 8:45 a.m. to 3 p.m. Costumes were encouraged and teams and individuals rallied by wearing bright tutus or neon shirts with matching socks. For a team of seven middle-school teachers from Cato Meridian, running as superheroes Batman and Robin, Spider Man, Captain America, and Wonder Woman powered enough enthusiasm to leap over hay bales, lift knees high through stacked tires and crawl under a covered, wet 30-foot trench. "It's pitch black in there," said Claudine Labeille, a sixth-grade teacher. Wendy Snodgrass, one of six members of Weedsport's "Here for the Beer" team, returns to the event each year because her team believes in the cause. Brown rivulets of muddy water streaking her face can't mask her beaming smile. "It's a good work out," she said. "It's fun."